Pro Tools | Would You Like To Support The Making Waves: The Art of Cinematic Sound Movie Kickstarter Project? Would You Like To Support The Making Waves: The Art of Cinematic Sound Movie Kickstarter Project? MAKING WAVES: The Art of Cinematic Sound is a feature-length documentary, currently in production, exploring the art, history, and aesthetics of sound in film, which the team making this movie are looking for additional funding from a Kickstarter Project. Primary production is now complete. This Kickstarter Project will allow them to edit, and complete a festival cut of the film, and they promise a film you will appreciate, learn from, and enjoy. What Is MAKING WAVES: The Art of Cinematic Sound? 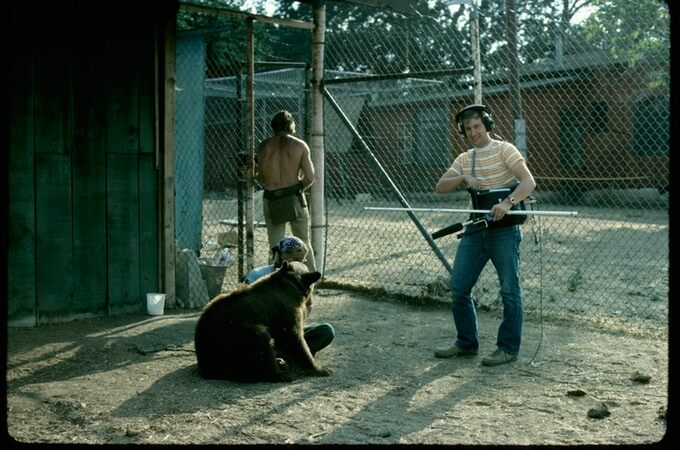 This movie will showcase the primal storytelling power of sound through the personal histories, experiences and expertise of sound pioneers who became award-winning artists in Sound Design. In the film, they interview premier Sound Designers like Walter Murch, Gary Rydstrom, and Ben Burtt (among others), as well as great Film Directors known for working closely with their Sound Designers, like George Lucas, Robert Redford, Christopher Nolan, Sofia Coppola, David Lynch, and Ang Lee (among others). The film is part history, part explanation and a big part revelation. For example, the sound of Chewbacca in Star Wars is actually the sound of a bear cub being tempted with his favourite food. The team behind the film are on record as being so grateful that so many uber-talented individuals who have been willing to meet with them and embrace their vision. The emergence of "the aural arts" in cinema has changed storytelling in film, and has had a huge impact on the emotions of many a moviegoer. Since the world of cinema is often a microcosm for life, they are hoping to espouse a larger message with this film too, and that is - "our overall human experience is so greatly shaped by what we hear". Midge Costin - Director/Producer - Midge is the Kay Rose Professor in the Art of Sound Editing at the USC School of Cinematic Arts. She is the first person to hold this endowed chair (given by George Lucas in 2005). For over 25 years she has been a feature film sound editor. She is a past board member of the Motion Picture Sound Editors, a lifelong member of the Editors Guild, and an avid sailor and kayaker. Bobette Buster - Writer/Producer - Bobette is a screenwriter, script consultant, and educator. She lectures internationally cinema storytelling, and sound and story, and regularly teaches Hollywood decision makers and creatives at Pixar, Disney, and others. Formerly an Adjunct Professor at USC's Peter Stark Producing Program. Bobette is the author of Do Story: How to Tell Your Story So the World Listens. Karen Johnson - Producer - Karen has produced fiction and nonfiction film, television, and web media. She has taken particular interest in subjects that feature compelling women characters or that have women writers and/or directors. Her producer credits include director Amanda Micheli’s award-winning documentary about Hollywood stuntwomen Double Dare. Karen is also an attorney. TIMELINE: Based on a successful Kickstarter that concludes and settles in early October, they expect to edit and complete a "festival cut" by February 2018. After key submissions, they aim to complete post-production and expect a final cut of the film in July 2018. Accordingly, they have projected fulfilling Rewards in August 2018 (although it is expected that many of the Rewards will be fulfilled earlier). BUDGET: 50% of the TOTAL budget to make this film was raised prior to this Kickstarter. They project that if successful, this Kickstarter will provide a big chunk of what remains, and the balance will come from investment contingent on this Kickstarter. The film has received a California Humanities Grant. 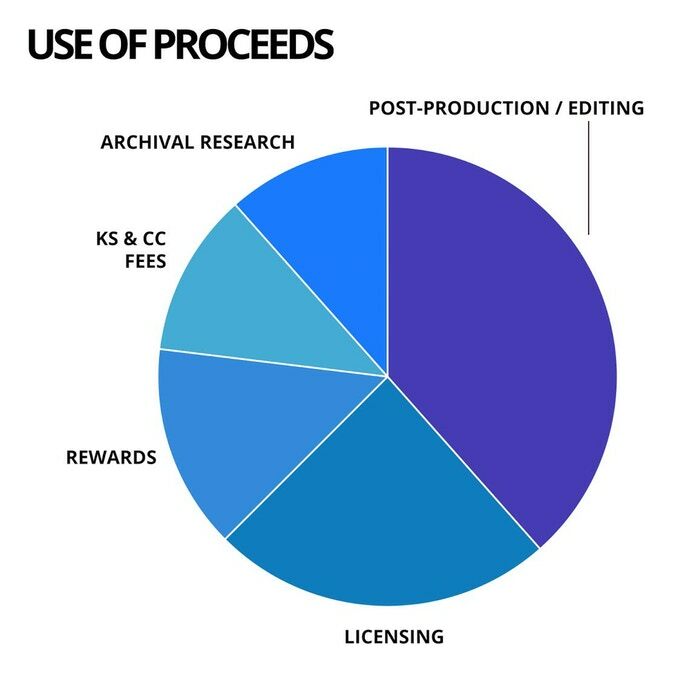 USE OF PROCEEDS: The pie chart below reflects the Use of Proceeds from funds raised through this Kickstarter only. Making a full-length feature film, documentary or otherwise, is a challenge for anyone, even for a major studio. It is a substantial endeavour, with many moving parts. Independent film producers have to especially be able to roll with the punches. They have done their best to minimize risk and maximize use of funds and they are passionate about saying that they have done this without the slightest compromise to the message, the story, and the quality. It's taken several years to get it to this point, and say that they have done what they had to do - raised and/or borrowed money, and financed some of it to date from limited personal funds, thus reducing what is needed for this campaign. The funds from this Kickstarter project will allow them to complete the editing, music licensing, clips licensing, colour correcting, and all those other myriads of post-production elements that can really make a film special. They have even been securing other arrangements predicated partly on the success of this campaign. They state that the scope of work, time frames, and budgets are reasonable and this is a team that has a passion for filmmaking and for sound design in particular, and a determination to match its passion. In summary, they say with total confidence - when the Kickstarter campaign succeeds, the film will be made; and all rewards will be delivered fully and on a timely basis. What Pledge Options Are Available? They start from a stunning screensaver with sound for a pledge of $6, via a Blue Ray disc of the film with additional benefits for a pledge of $45, through to a private screening for 10 people for a pledge of $5,000 and on up to co-producer slot for a pledge of $10,000. Do visit the MAKING WAVES: The Art of Cinematic Sound Kickstarter Project page for full details and to be able to sign up to make a pledge to fit your budget. The project needs to be fully funded by October 6th, 2017. THE TORRESIAN RAVEN by Mark Mangini (Mad Max Fury Road) - a bird species indigenous to Australia with a distinct signature call that ends in a moan, used in the main title of Mad Max Fury Road and as the birds of prey in the blue "bog" sequence. Both of these are so awesome, that whichever one you pick, every time your phone rings, the person you are with will look at you in amazement, and ask "what the heck was that"? Available at EVERY level, beginning at $12.